Tag line: "Set In A Spectacle of Thrilling Magnificence!" Decades before Elizabeth Taylor and Richard Burton set the gossip columns ablaze with their scandalous on-set romance, Cecil B. DeMille directed his own version of Cleopatra, and while this earlier film didn’t stir up controversy like the 1963 picture, it’s every bit as grand. It’s 49 B.C., and Egypt is in turmoil. 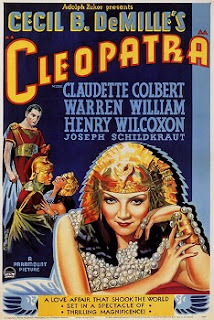 Though co-ruler with her brother Ptolemy, Queen Cleopatra (Claudette Colbert) has just been kidnapped by Pothinos (Leonard Mudie), Ptolemy’s closest advisor, who drops her in the middle of the desert and leaves her to die. It’s Pothinos’ hope that, with Cleopatra out of the way, the Roman general Julius Caesar (Warren William), who has recently arrived in Egypt, will recognize Ptolemy as the country’s sole leader. But Cleopatra isn’t about to give up without a fight, and beats the odds by making her way back to Alexandria, where she quickly wins Caesar’s approval as well as his heart. In fact, Caesar is so in love with the young Queen that he takes her to Rome with him, where, after divorcing his wife Calpurnia (Gertrude Michael), he will marry Cleopatra and establish her as co-ruler of the Roman Empire. But, alas, it was not to be; while on his way to the Senate to announce his plans, Caesar is assassinated by a number of Senators who fear his power is becoming too great. Without Caesar to protect her, Cleopatra flees the city and returns to Egypt. Mark Antony (Henry Wilcoxon), a Roman officer and close friend of Caesar’s, promises to bring Cleopatra back to Rome in chains, but once in Alexandria he, too, falls under her spell. When word reaches Rome that Antony and Cleopatra are lovers, Caesar’s nephew and heir, Octavian (Ian Keith), denounces Antony as a traitor, initiating an all-out war between the two men. Can Mark Antony and Cleopatra stand against the might of Rome, or are they destined to die at each others' side? Like many historical epics, Cleopatra has its share of big scenes: Caesar’s and Cleopatra’s parade into Rome features hundreds of extras; and a late battle between Antony’s and Octavian’s forces is wonderfully staged (footage from the 1923 silent version of The Ten Commandments is used to fill out this sequence). Also quite spectacular is the reenactment of Caesar’s assassination at the hands of Brutus (Arthur Hohl), Cassius (Ian MacLaren), Casca (Edwin Maxwell), and others. But as awe-inspiring as these individual moments are, it’s Claudette Colbert’s turn as the wily Queen of Egypt that makes this version of Cleopatra so unforgettable. Colbert shines in those scenes where Cleopatra seduces both Caesar and Antony, and her character’s willingness to do whatever it takes to stay in power is both inspiring and a little scary (the sly manner in which she administers poison to Antony’s drink in one key sequence is truly remarkable). All this, combined with its costumes and set design, makes Cleopatra one of Cecil B. DeMille’s most impressive early accomplishments. AWESOME STUFF.........A LITTLE CAMP AN A LOTTA CRAZY?